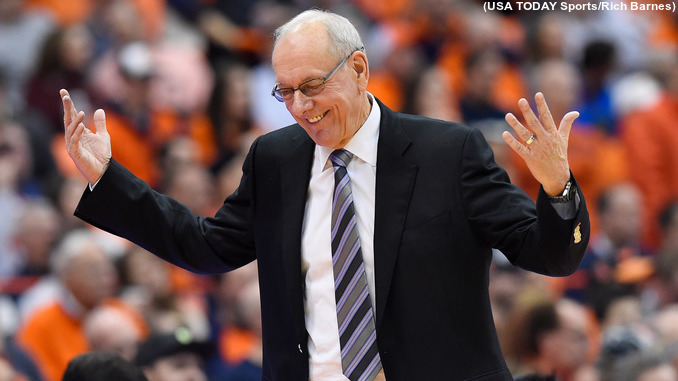 Syracuse Orange head coach Jim Boeheim reacts to a call against during the second half at the Carrier Dome. Syracuse coach Jim Boeheim achieved yet another milestone in his historic coaching career on Monday, improving to 3-2 in road games against AP No. 1 teams with a win over No. 1 Duke. Syracuse at No. 1 Duke (WIN, 95-91. Jan. 14, 2019): Tyus Battle’s 32 points helped Syracuse overcome an early 12-0 deficit and 35 points from Duke foward Zion Williamson. Paschal Chukwu plays the game of his career, scoring 10 points to go with 18 rebounds, including three key free throws in overtime. No. 6 Syracuse at No. 1 Louisville (WIN, 70-68. Jan. 19, 2013): Brandon Triche scored 18 of his team-high 23 points in the first half, and Michael Carter-Williams stole the ball twice in the final 30 seconds to lead Syracuse to the upset. Carter-Williams scored 11 of SU’s final 13 points, including a thunderous dunk with 23 seconds left to put an emphatic exclamation point on the win. No. 23 Syracuse at No. 1 Connecticut (LOSS, 63-49. Feb. 11, 2009): Hasheem Thabeet scored eight points, grabbed 16 rebounds and added seven blocks to hand SU its fifth loss in six games. Jonny Flynn had 16 points for Syracuse, which lost contact with the Huskies during a 12-0 run midway through the second half. Syracuse at No. 1 Connecticut (LOSS, 73-50. Feb. 8, 2006): Rudy Gay scored 22 points and added 13 rebounds as the Huskies dominated the Orange from tip to the buzzer. The Orange fell behind 37-19 at halftime and never got closer than 13 points in the second half. Darryl Watkins had a team-high 12 points, and chipped in nine rebounds and four blocks. No. 16 Syracuse at No. 1 Connecticut (WIN, 59-42. Feb. 1, 1999): Much like Duke was without starters Cam Reddish and Tre Jones on Monday, the top-ranked Huskies were missing starters (and future NBA players) Richard Hamilton and Jake Voskuhl. That resulted in the Huskies’ first loss of the season, though Connecticut would go on to win the NCAA Championship that year.